DESCRIPTION : Illustration for Illustration Friday, for the topic word "Subtract." When looking at this, don't think too hard about the Principles of Invisible Paint. I'm sure many of you would argue that, if Invisible Paint were a reality, it probably wouldn't cause people to look like they are breaking apart like Play Doh™. But, you have to admit it would be cool if it did. 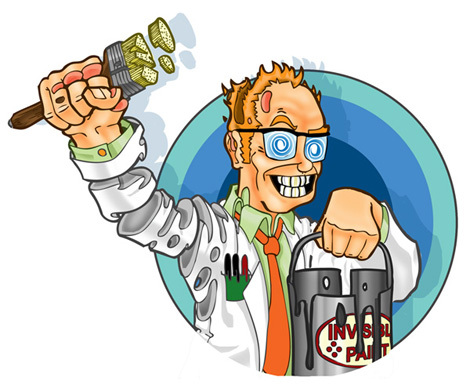 So, buy some of Dr. Beacon's Amazing Invisible Paint now! MEDIA : Hand drawing, colored in Photoshop.